The NEMO Cloudview hammock is what I would call an open hybrid hammock. It contains elements of a bridge hammock with a drop on the foot end but also a standard spreader-bar hammock on the head end. The fabric is a thick, stiff, and open mesh that reminds me of patio furniture. On the right side there is a pouch opening for a water bottle. A cinch cord on the pouch can adjust it for smaller items. An envelope-style pouch hangs off the left side and can hold an iPad or book easily. The foot end of the hammock has a 3D trapezoidal box shape that drops the feet down significantly. 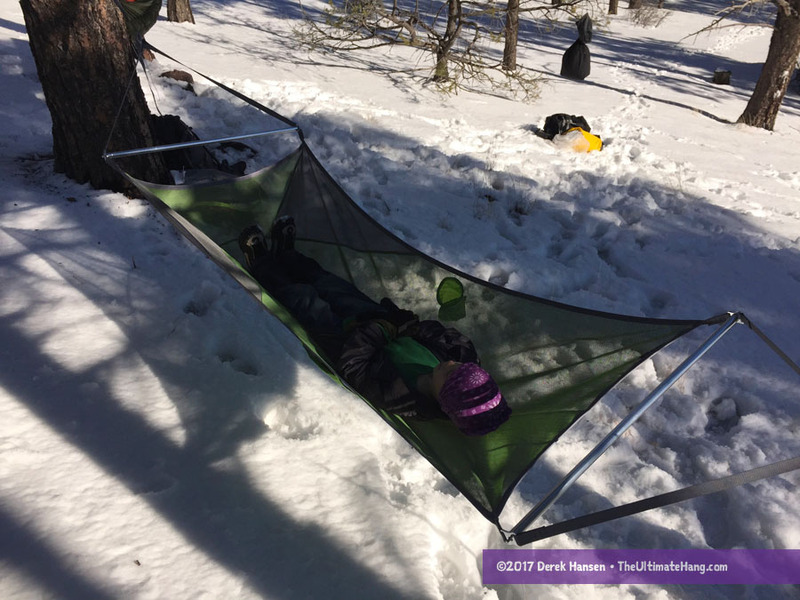 NOTE: NEMO expressed that this hammock is intended for front-country adventures and is marketing it more of a recliner rather than a backpacking shelter. To that point, the hammock is an open-style and lacks a bug net or tarp. I really like the quality of the NEMO products. They often include subtle features that can go unnoticed but really enhance the overall design. The Cloudview hammock is simple, but elegant. The lines and shape just feel and act naturally together. At first glance, the design seems incomplete when compared with current bridge-style hammocks. The head end, for example, doesn’t drop down into a barrel shape like most models. However, in use, the design is probably the best lay I’ve had in a bridge-style hammock. I classify this hammock more of a hybrid than a true bridge because it merges concepts from traditional “flat” spreader bar hammocks and bridge hammocks. It’s a great combination. I don’t have any shoulder squeeze issues that is often felt in traditional bridge hammocks. The fabric is interesting. It’s stiff and feels very durable. It’s also very breathable. The mesh is very much like mosquito netting and you can easily see through it. The stiffness also aids in a flat lay. Setup is a breeze. The spreader bar poles have shock cord inside, which I LOVE because it keeps the pole segments together. The stainless steel hardware is polished and custom designed and stamped just for NEMO. It’s a nice touch. The end adjustment clips and webbing attachment are very similar to the Chrysalis hammock. However, I really like the one-two-three dots embossed on the side, a subtle indicator for how to thread the device. The last section hooks around both ends of the strap to secure it. While this hammock is probably too heavy for taking backpacking, it’s a great hammock for camping in the front country or at home. A tapered pad or underquilt would work fine. I found that lifting the foot end a little higher than the head end helps in making a real head-to-foot flat lay. I would really like to see NEMO come out with a model made with lighter fabrics and poles because it would make a great hammock for backpacking. Suspension and Anchor System ♥ ♥ ♥ ♥ ♥ Thick and strong webbing straps included. Construction and Craftsmanship ♥ ♥ ♥ ♥ ♥ Very high quality. Modularity ♥ ♥ ♥ ♥ ♥ It’s a great base for a modular set-up, like any open hammock. Getting bug protection top and bottom is essential. Aesthetics ♥ ♥ ♥ ♥ ♥ No color options, but the design is striking. Next: Next post: Thank you for your patience!